Samsung is working hard to eliminate bezels from its smartphones. From the circular camera cut-out in its forthcoming Galaxy A8s, to the notchless, edge-to-edge design tipped to launch with the flagship Galaxy S10 and Galaxy S10 Plus early next year, it's clear the South Korean company is not a fan of borders around its screens. 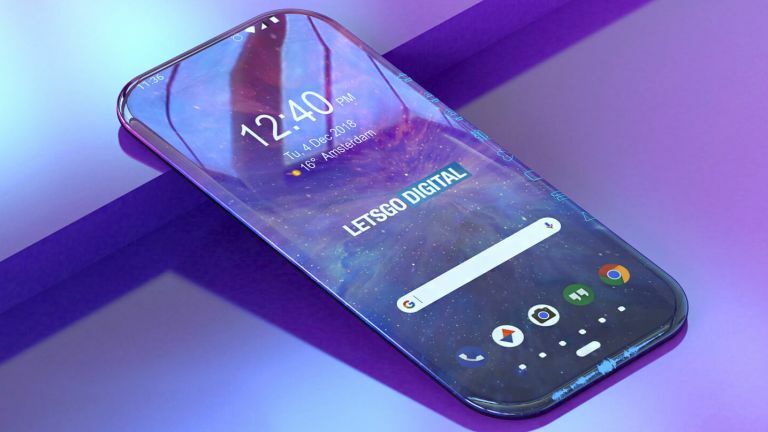 Now, thanks to a newly-published patent, which was unearthed and gorgeously mocked-up by team at LetsGoDigital, we now have an idea of just how far Samsung is looking to push its all-screen designs in future iterations of its Galaxy smartphones. Filed with the World Intellectual Property Office (WIPO) back in April, the patent describes an electronic device with a display that wraps around all four sides of the handset. According to the patent, published by WIPO late last month, these touchscreen surfaces create a truly border-less effect when holding the smartphone. The patent also details how the handset would use the same pliable OLED technology unveiled on-stage with the so-called Galaxy X during the recent Samsung developer conference. These flexible displays should enable Samsung to use a single OLED panel to cover all four sides of the handset. Samsung already uses a similar design with its flagship Galaxy S and Galaxy Note product ranges – albeit only on two sides of the handset, not across all four. Dubbed the Infinity Display, Samsung uses this dual-curved screen design to extend the panel over the edges of the handset. This allows the phone maker to squeeze more screen real estate into its handsets, while keeping their physical footprint small enough to still use one-handed. Whether this will extend to all four borders of the smartphone in future iterations of the Galaxy S series – the Samsung Galaxy S11 in 2020, for example – remains to be seen. Unfortunately, the patent does not elaborate on the possibilities of the display areas on the sides of the smartphone – or whether they will be used for input. However, one of the illustrations filed with the patent shows app icons being shown on the curved side of the smartphone, similar to the Edge panel on the Galaxy S9. It's worth taking this all-screen smartphone design with a pinch of salt. After all, Samsung patents a slew of new technology and features which never leave the R&D department inside the company, so it's possible this biometric sensor will never make it into a final product. But we're keeping our fingers crossed that it does.